TESTIMONIALS — hive architects inc.
Joe Kelly was referred to us by one of Sarasota's most esteemed architects. He reasoned that Joe's proficiency in all phases of construction and his talent in interior design would fit in well with our complicated and extensive renovation project on Westway Drive in Lido Shores. From the inception Joe was very engaged and we were thrilled with each stage of his planning. Joe is a visionary but is also sensitive and flexible to his client's needs and budget. He has been present and involved in every minute detail of the design and construction, working efficiently with and guiding our general contractor. The recent addition of Gwen Kelly to Hive Architects has only enhanced the scope of this firm. This is a team that lives and dreams their projects. 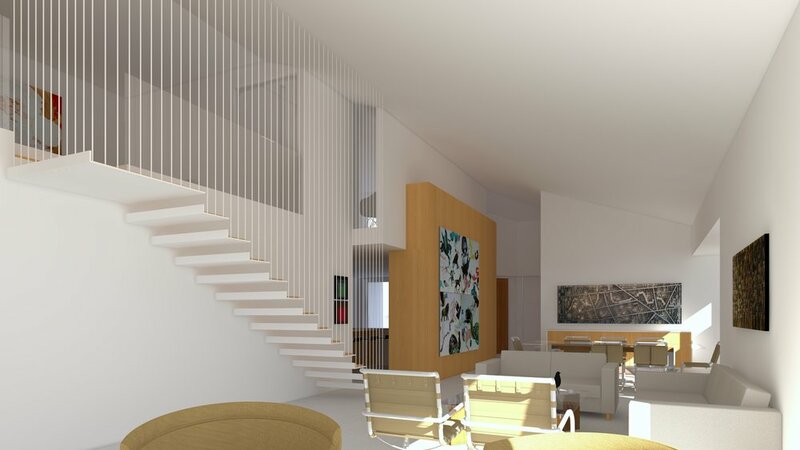 Their combined experience and youthful energy is going to explode the Sarasota architectural scene. We feel so fortunate to have teamed up with Joe and Gwen both professionally and personally. This team is going to soar and we cannot recommend Hive Architects highly enough. I worked with Joe Kelly, AIA on my complete remodel project located in Lido Shores. This was a very challenging project and Joe was outstanding in helping me navigate. He was especially helpful in narrowing options and steering me in the right direction without discounting my own views and aesthetics. I also appreciated his mediating any issues that presented themselves with the builder relationship. His ability to listen to my needs first, before recommending a design solution was a huge help and I really appreciated his professionalism throughout the process from the beginning planning stages through project completion. All in all, a very positive experience and I would recommend him highly to anyone that is considering an architect for their project. I had the opportunity to work with Gwen through several different projects with several different project owners. The most recent project was the design and construction of a 4-fire station program, and largely thanks to her dedication and tenacity, all 4 project were completed within budget and on time. While each station came with unique challenges, Gwen retained her sense of humor and creative thinking throughout the project. I found Gwen to be incredibly adaptable when it comes to working with different clientele and project types. Based on my experience, she easily adapted to the mindset of Libraries staff as well as Emergency Services, who can be on opposite ends of the spectrum in problem solving methodology. In addition, although each project Gwen and I worked on together consisted of a slightly different project design team, she adapted well to each team dynamic regardless of consultant. Gwen’s eye to detail helped us resolve numerous issues in design, well before ever having the opportunity to become an issue in construction. With her attention to detail, project management skills, and adaptability, Gwen would be a great addition to any project. It has, sincerely, been my pleasure to have the opportunity to work with her. When my wife and I decided to build our home on Palm Island on the Gulf of Mexico, we knew it was going to be a major task. The house is of modern design, over 5000 square feet, poured concrete, and five stories tall – if you count the pool on the roof. It is situated right on the beach of an island with only ferry service. To complicate matters further, we were living in Oklahoma during the construction. Fortunately, the project architect was Joe Kelly, who, with his professionalism and approachable manner, made the process a delight – and not the harried experience others were predicting - during the approximate two years of construction. Joe is knowledgeable, articulate and thorough. He listened well, answering all of our questions and concerns. He was not afraid to give his honest opinion on whatever was needed. His attention to detail and his knowledge of material options were invaluable. He is an excellent problem solver. My wife and I are very happy with the final product. Joe is a true professional. We consider Joe a friend and wish him well in his career. Gwen Leroy-Kelly was the project manager on our library remodel and addition project. Gwen worked with the design team to put together an initial design and layout. She organized the required public meetings in a competent and proficient manner. The project involved a 6,750 square foot expansion and renovation to the library building. She assisted in all phases of the design of the interior including the furniture and fixture choices, wall colors and floor coverings, and the signage and physical layout. Her recommendations were well put together and presented in a professional manner. All work was done in a manner designed to keep library services available to our community throughout the project. Gwen and her team worked with library staff, Facilities staff and our contractor to build the best building possible within our limited budget and the constraints of renovating an existing building. We receive compliments every day from our customers about how colorful, comfortable, functional and welcoming the renovated facility has turned out thanks in great part to Gwen’s contributions. 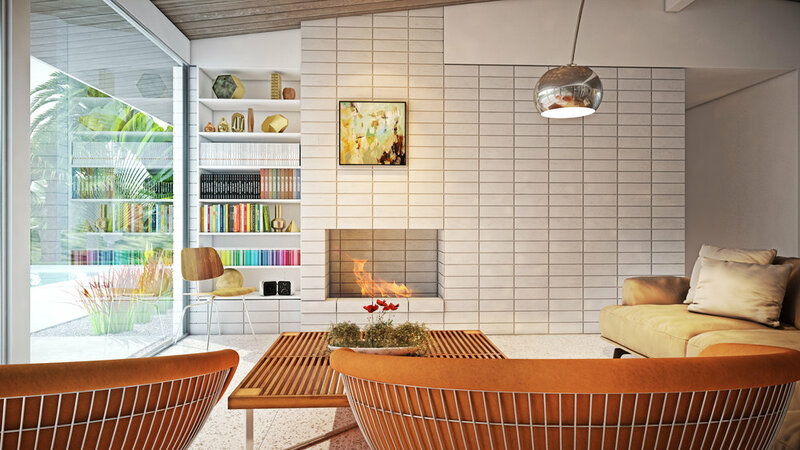 I first became acquainted with Joe in 2004, when he was project architect on the addition and intricate renovation to the Revere Quality House, a large custom residence typical of the Sarasota school of mid-century modern architecture. It was an extremely challenging project to do. Joe and I worked closely together and I enjoyed the process tremendously. Joe’s proficiency in making clear, detailed drawings/documentation helped a great deal with both the permitting and the project management processes. The result was exceptional, and this was in no small part due to Joe’s in-depth understanding of the project and his ability to work efficiently as a part of a team. Since then Joe and I have worked together very successfully on a custom residence for Terry and Nancy Turner in Cherokee Park, and more recently on a pool pavilion for the Motto house. 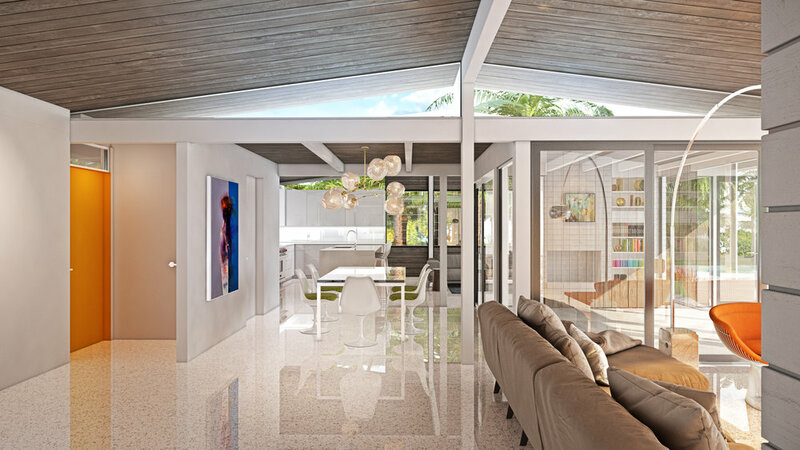 Last year we worked together on a large, particularly ambitious new house for Jerry and Karen Agee on Siesta Key. Joe has certainly never been one to shy away from a challenge. In conclusion, looking back over the years Joe Kelly and I have worked together on various projects, I can say he is without a doubt an extremely accomplished, hard-working professional, both technically and artistically. He has a keen sense of design aesthetics as well as an extensive understanding of the principles of sound building construction. Those assets are essential for an architect, but Joe has the additional advantage of being easy and fun to work with, effective with clients, subs and building department officials. In my experience it’s rare to meet an architect who is able to strike that perfect balance between creative direction and willingness to negotiate compromises in order to accommodate the needs of the builder and customer. It is my pleasure to recommend Joe wholeheartedly. Pat Ball | President, Ball Construction, Inc. I had the pleasure of working with Gwen on the $16MM fire station program for Sarasota County which consisted of four new stations for County over a two year span. This letter of recommendation is a way to express my gratitude for her dedication and hard work on those projects. As Project Manager I worked with Gwen daily from pre-construction through closeout and the projects were a success due to her key role with the team. Gwen has a clear passion for architecture and interior design as it shows in her professional and fun attitude. It’s enjoyable to work with someone who is driven by their work and it equates to a successful project for all team members and the owner. I look forward to the opportunity of working with Gwen again in the future and given the opportunity would recommend her services to any prospective client. Our experience working with Gwen has been excellent. She is a true professional who brings important construction knowledge and outstanding management skills to all her projects. Our firm worked with Gwen on the Caspersen Beach Restroom and Utilities project, Manasota Beach Park Improvements project, and the St. Paul’s Presbyterian Church project. Throughout the durations of each project Gwen provided excellent service. She carefully managed every aspect of the project to ensure a smooth flow of work. Anyone would be well served in choosing Gwen’s design firm for their upcoming project. Clint A. Riley | Vice President, Magnum Builders of Sarasota, Inc. The biggest fear of an owner is that the finished product fails to reflect the architectural vision of a wonderful plan. As a public-sector client, I appreciated Gwen's ability to connect the architecture and the construction to consistently achieve the anticipated results. Gwen's understanding of complex construction processes resulted in timely decisions about materials, finishes and colors, bringing both efficiency and energy to the projects.